Star Wars: The Last Jedi hasn’t exactly been playing coy with its reveals recently. 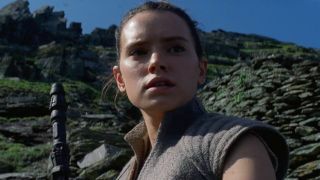 There’s been a few explosions and brand-new ships to set the pulses racing, but now things have been scaled back considerably in this brand-new image – back to where it all began (or ended, in the case of Star Wars: The Force Awakens): Rey and her stick. Yahoo Movies have shown off the exclusive shot featuring Rey on Ahch-To getting her Karate Kid on. No waxing on and off here, though, just a beautifully serene landscape, the horizon in the distance, and more rock formations than you can, uhh, shake a stick at. Speaking of that stick, there’s no sign of Rey upgrading to anything more lightsaber-y anytime soon – in fact, the discarded robes in front of Rey hint at this shot coming from an impromptu training session. No Luke, though. Is Rey on her own... for now? Daisy Ridley has already spoken of her character’s disappointment once she’s face-to-face with Luke. Maybe the ‘80s training montage we’d all hoped for between Luke and Rey isn’t quite coming to fruition or maybe – just maybe – there’s been a Force falling out over the fate of the Jedi. Or Luke’s gone to play with the Porgs. There’s always that possibility. If you want more Star Wars: The Last Jedi news then GamesRadar+ is the place to be: There’s shots of General Leia looking every bit the badass, and why George Lucas might still be (kinda) involved with Star Wars 8.